As I listen to the winter rain dripping from the roof outside, and silver drops slide down the panes of my study window, wishes for warmth and sunshine aren’t far. In the summer of 1978 Travis Lake in Austin had been engineered into a bigger lake but hadn’t filled completely. This feat of man’s desire had so far created several stump-studded inlets and striations of deep water surrounded by piles of boulders. I had traveled from Houston with a group of church friends to swim and frolic in the sun beside one deep part. All around the lake, bright parties of sun-seekers sprawled on warm rock amidst drifting Marijuana smoke. I had only recently completed a course in lifesaving. It meant that I could swim a mile, seventy-five laps to be exact. I stood and declared that I would swim across the inlet. (Because I was prone to declaring and still am, so watch it!) It was less than a mile, probably seven hundred feet in width. But then came the spanner in the works ~ friend Don decided he would go with me. Don was sweet but he had just learned to swim. That compounded with the fact that he had a mild case of cerebral palsy so that his left side was slightly crippled meant I didn’t trust that he should swim across and said so. He insisted he could, besides he mentioned that I had been the one with training as a lifeguard. What is it about guys that they make such declarations in the face of facts. I protested strongly, appealing to those around us. No help there. There was nothing for it but to do or die. I’m afraid the die part came much too close. “I can’t.” His voice was thin, strained, catching between gasps. “Life . . . saving . . .” He choked on a mouthful of lake. Still nothing. Oh Lord! Help us! He sank beneath the waves. Dear Lord, help us! Don’t let Don die like this. Then, and this is the part that happened too fast for me to actually have any reaction save astonishment but this IS what happened, Don shot up out of the water. I couldn’t even now describe what happened in any other way. There was a man beneath him, raising him. Where had this stranger come from? He cradled Don in his muscular arms and turned to me and asked if I needed help. I told him I could make it. We swam to shore in silence. Once ashore, the stranger helped Don to a dry boulder. A crowd surrounded us at once. Many explained they thought we were playing out there. I turned to thank the stranger, but he was gone. I asked others where the big guy who had rescued Don went. No one knew what I was talking about. No one had seen the rescue. We were flailing in the middle and then we were crawling out of the water. Don knew there was someone else out there but hadn’t seen where he’d gone either. I couldn’t describe the man. He had long hair but all the guys in the seventies had long hair. I couldn’t tell you what his face looked like, the color of his eyes, only that he had muscular arms. Today, I reflect that if Don had passed into eternity that day it would have taken me a long time to get over it. I would have been angry, blamed myself, all kinds of mess would define my life. But it didn’t happen that way. Don lived. The last I heard he was doing what he had always wanted to do – be an airplane mechanic in Seattle. In 1996, I was in a van with six other ladies on Saturday afternoon. We had been out in the Round Top, Texas area looking at antiques after enjoying a good time together at a ladies Bible study retreat. From here on what I retell will be what I have been told because I can not recall any of it. Our van had slowed and come to a stop to turn left off of the highway. A small truck traveling at about 55 miles an hour slammed into the back of the van sending it spinning across the highway and head-on into a ditch between two live oak trees. I was the last one pulled from the accordioned van. I was lengthwise down the middle aisle of the seats covered by the decorative paneling and window blinds and other van parts which hid my body from the paramedics. I first became aware of the dark because it was growing lighter. There were waves of gray all around me. I couldn’t see anything but the curtains of different shades of gray. I heard the voices. They were discussing my condition. Would I make it? I had to, I replied. I had to live. I couldn’t die. I had small children. They couldn’t grow up without a mother. But the voices didn’t pay any attention to my distressed answers. They spoke over me. They didn’t speak English. I couldn’t tell what kind of language it was and I couldn’t figure out why I understood it so well. This back and forth took some time. I don’t know how long, just that it seemed time passed in squiggly lines of gray. Finally, the consensus was that I would live. Or was it that I would get to live. Because God wanted me to live. I recall bits and snatched views of people I knew. They spoke around me, it seemed, as if I wasn’t there. Asking me what I thought were ridiculous questions and then roaring with laughter. I was quite serious about my answers but everyone else thought I was a hoot. I was puzzled as to why I couldn’t see them. I thought my eyes were covered but I touched them, they weren’t. I kept trying to explain that we were in the hospital because of the pine cone fight. Hoots. 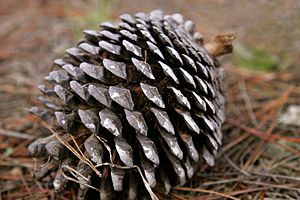 Pine cones hurt, you know. Laughter. What happened to the ducks? Ducks? The ones all around us. More laughter. I couldn’t grasp why they didn’t understand the seriousness of the situation. The situation about the pine cones and the ducks. When I came to, the first thing I remember was the clock on the wall was upside down. Someone bent over me and their face wasn’t right. It was wavy and all nose. Whoever it was probably wouldn’t want to be remembered like that, but there you have it. The second time I came to, my husband was sitting at the end of my bed. He asked me how I was. I asked him where I was. The hospital. It was Monday. That is really NO way to wake up from the weird pine cone fight dreams, I can tell you. I didn’t understand why I was in a hospital. That was when he explained I had been in a wreck. I was most concerned about where the children were. They were staying with friend, Wayne and Shirley Pittman. The second thing I was most concerned in what I now think was an absolutely over-the-top way was the dog. Where was he? Did he have water? I wanted to know details. About the others in the van. Yes, they had been hurt. Mostly stitches and staples and bruised innards. None in the hospital. The young man who had hit us had been drinking and was reaching for something when he ran into us. Didn’t even see us. The van’s gas tank had imploded upon impact, all the windows except the front one were gone instantly. My seat belt had torn, my captain’s chair shorn from its base. All the other seats had gone flat back and the other passengers watched my rag-doll-like body thrown from front to back several times as the van spun. I had concussion with mild brain trauma, the bruising that occurs when the brain is jostled inside the skull. The real damage wouldn’t be apparent perhaps right away. Over time I had to deal with speech problems – lost nouns, halting speech, and unable to co-ordinate the tongue during speech so that I would bite it – loss of some long-term and a lot of short-term memory, depression and uncontrollable emotional outbursts, loss of the brain’s maps of time, dates, what the days of the week look like, over-impulsive lack of judgment meant I couldn’t drive for some months (though now I regret I didn’t go out and buy a Mercedes and blame it on impulsive disorder). I determined to get better and believe I’ve achieved that goal over the years though I still get flustered when I lose the word I can see in my head like on the computer screen in front of me, but can’t find the name of. This willy-nilly speech problem led me to finally pursue my life-goal of writing novels. Because tomorrow is never a guarantee, there is no putting off until I “get around to it”. I do as much as I can every day. Writing is also a wonderful tool of speech therapy, searching, always searching for the perfect word. The accident changed me in more ways, too. I remember after the accident as my full body bruise turned from black to blue to green and yellow, I would sit outside and stare at nothing and reflect that life goes on with or without me. I have very little to do with the running of life. There is peace in that. The accident gave me a certain understanding of eternity. Beyond the waving gray are the angels. They don’t know the future but they know that God holds the future. And this is as it should be. I was given another day just as Don was given another day. We can’t thank the angels. They don’t stick around for us to thank them. They want us to thank the One who deserves our thanks. To God be the glory. Beautiful. And I’m glad you had an angel that day.